For awhile I wrote it off as just some sort of weird coincidence. It can’t be mere coincidence that week after week, race after race, three Hendrick Motorsports drivers do so well while a fourth flounders. It happened again Sunday in California. Jimmie Johnson won the race. One of his teammates, Jeff Gordon, was second. A third teammate, Mark Martin was fourth. The fourth teammate, Dale Earnhardt Jr., was 25th. Granted, Junior got caught up in a wreck. That seems to happen often to Earnhardt this season. Or he has a bad pit stop. Or the engine blows. Or the sun gets in his eyes. It’s always something. That’s why his three teammates all are in contention for a championship while Junior never came close to even making the Chase. Earnhardt’s persistent struggle is the biggest puzzle in NASCAR, and it grows more mysterious with each Junior flop and each Johnson-Gordon-Martin success. There’s not just a gap between Junior and his three teammates – there’s a Grand Canyon. An abyss. It’s like they’re not even in the same league. I don’t believe it’s lack of effort and desire on Earnhardt’s part. Anyone who’s been around him knows that Junior is aware of who he is and of the legacy he inherited. He seems driven to win. Is he getting short-changed on equipment or support? It’s hard to believe that boss Rick Hendrick would stand by and permit that to happen. Surely he knows that he possesses the single most valuable commodity in NASCAR – Dale Jr.’s popularity – and if Junior could start winning his value would go through the roof. I’m convinced that Earnhardt is trying hard. I can’t believe that Hendrick is short-changing him. Yet I don’t believe that what we continue to see race after race this season is just some amazing coincidence. Why do three Hendrick drivers continue to soar while a fourth continues to sink? Something’s wrong somewhere. But where? If even one of the other three drivers were struggling like Earnhardt it wouldn’t be so puzzling. 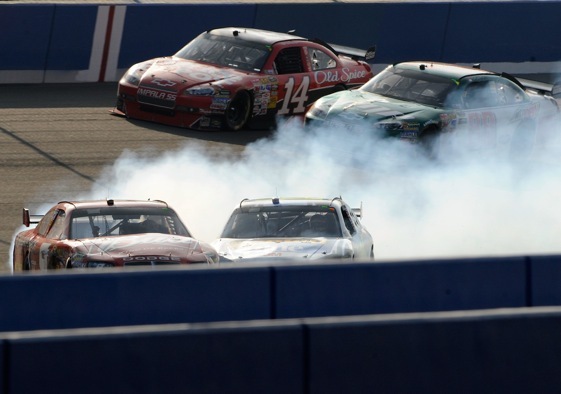 But when all three are sizzling, it magnifies Junior’s misery – and NASCAR’s biggest mystery. That makes this one of the old chassis that Tony Jr. made based on the specs he took from DEI in 2007. But with HMS making chassis for 6 cars you probably can’t expect more than 2 new chassis.